There is trouble all around us, it’s a part of business and a part of our lives. We all experience trouble of varying degrees throughout our lives. Often, we seek to avoid trouble, often we should be seeking the opposite. There are a few different mindsets we can have regarding trouble. We can hide our heads in the sand, we can deal with it when it happens, we can look for trouble, we can create trouble. Hiding our heads in the sand: Through unconsciousness or purposefully, we often ignore or avoid trouble. It could be the unhappy or difficult customer, it could be the poor performing sales person, it could be that “little” competitor. We live in business and personal worlds of constant change. Too often we may not be paying attention to those changes and their potential impact (positive and negative). Too often, we get complacent. Things are going well, we stop paying attention. Perhaps related to complacency is arrogance. We may be the top in our company or the top in our markets, we get arrogant, thinking no one could beat us or we take things for granted. Not paying attention is a guaranteed route to failure–or at best, mediocrity. Dealing with it when it happens: Perhaps most of us are great at responding. We’re agile, nimble, able to move fast. We’ve been trained to “solve problems,” so we move mountains when problems occur. But this “react” mode makes it difficult for us to achieve our goals, to grow, and differentiate ourselves. We get diverted from the execution of our strategies, we have to respond to external disruptions. It’s kind of like the carnival “bumper cars,” it becomes very difficult to be where we want to be, because things keep diverting us. In sales this is particularly dangerous, it’s often our competitors setting the direction and driving the customer buying process, and we respond as best we can. We can’t anticipate everything, we have to be effective and efficient in responding to changes and disruption, but we have to quickly move back to proactively driving our strategies and achieving our goals. Looking for trouble: Some people ardently chase trouble down. They are continually looking for problems and opportunities–problems our customers have, problems within our own organizations, problems in our own performance. They know that trouble is an opportunity to learn, grow and improve. It’s an opportunity to change and be changed. Rather than those who avoid it, these people hope to identify and seize opportunities early. They know they earlier they identify problems and opportunities, the greater their options for determining how to best address them. 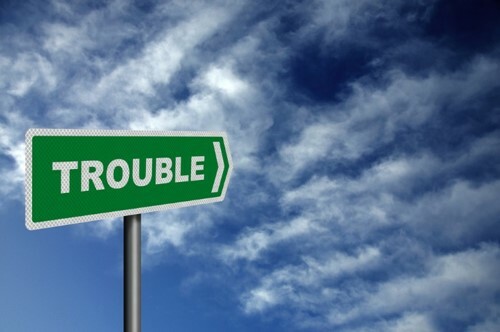 Creating trouble: And there are those who create trouble–here we have to be careful. You may think I’m building to a set of behaviors and attitudes we should all have. Certainly, there’s a positive aspect of creating trouble. Disrupting what we currently do, thinking of new methods, new approaches, new opportunities can be very powerful. Innovating, changing our view of the world and driving improvements know one has conceived is very powerful. These are opportunities to grow, thrive, improve. These troublemakers are builders, they seek to create new things and value for others. But there’s a dark side to creating trouble. It’s ignorance, selfishness, thought-lessness, maliciousness, and hatred. There are those that seek to create trouble that is destructive, they play in the cold politics of winners and losers, always positioning those that don’t support them as losers, seeking to destroy them. Creating trouble is a double edge sword, what kind of trouble we create is driven by our intent. What kind of troublemaker are you?